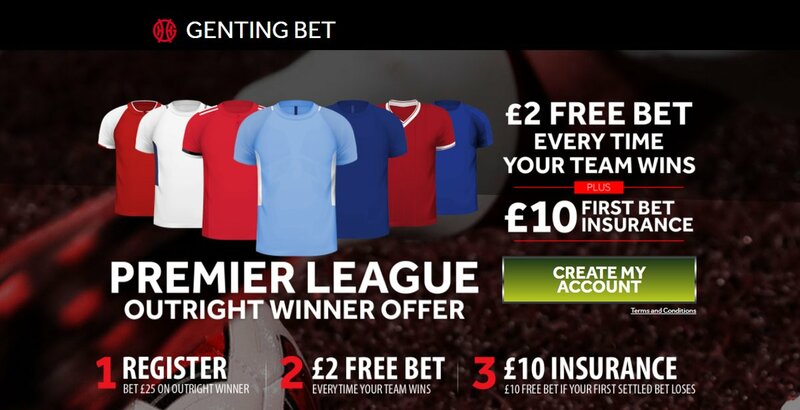 Genting Bet bookmaker has launched a tasty betting offer on the 2017-2018 Premier League season! Bet £25 on your pick and get £2 free every time your team wins a match before 31st December! Get a £2 free bet every time your team wins a Premier League match until the end of the year! Plus, you will get a £10 free bet if your first settled bet loses! Once you have registered a new account via Genting Bet and deposited £25, you could back Liverpool to win the 2017/18 Premier League @ 12/1. Here's how it would have work. Only recreational customers are eligible for this offer. First win single bet of £25+ (or £25+ win single part of e/w bet) placed before 1st September on the Premier League Outright Winner Market will qualify. A £2 free bet will be credited to your account within 48 hours of your selections winning Premier League matches between 11th August and December 31st 2017. Free bets must be wagered in full on a selection with odds no greater than 4/1 (5.0) and can be redeemed on single bets only. Any returns from a free bet will be paid back into your account minus the free bet stake. Free bets expire if not used within 3 days. Any returns from a free bet will be paid back into your account minus the free bet stake. From September onwards players must place at least £20/€20 real money stakes in a single calendar month to continue qualifying for free bets in the subsequent following monthly period, e.g. to qualify for October’s free bets, you must have staked at least £20 between 1-30 September. A "Qualifying Bet" is a losing first settled real money single bet of at least £/€10.00 or more at odds of Evens (2.0) or greater (or a multiple where each selection is at odds of 2/5 (1.4) or more) on a sports betting event of your choice. Free bets will be credited to your account within 24 hours of your Qualifying Bet settling and expire if not used within 14 days. Free bets must be wagered in full on a selection with odds (or a multiple with combined odds) no greater than 4/1 (5.0). Any returns from a free bet will be paid back into your account minus the free bet stake. This offer is only open to new Genting online customers. 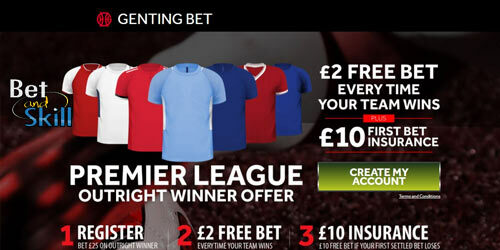 "Genting Bet Premier League Offer £2 Free Bet Every Time Your Team Wins"